Step away from the stove. I repeat: Step away from the stove. If it’s hotter than a jalapeño in your kitchen, then allow me to introduce you to summer’s biggest dinner winner: Fast and Fresh Gazpacho! 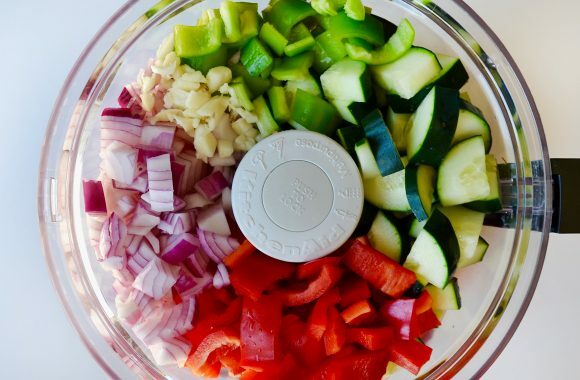 Crisp veggies, chopped garlic, and a drizzle of oil and vinegar whiz together in a food processor or blender, and the result is a creamy, cool, no-cook meal perfect for dishing into big bowls or serving as appetizer-sized shooters. 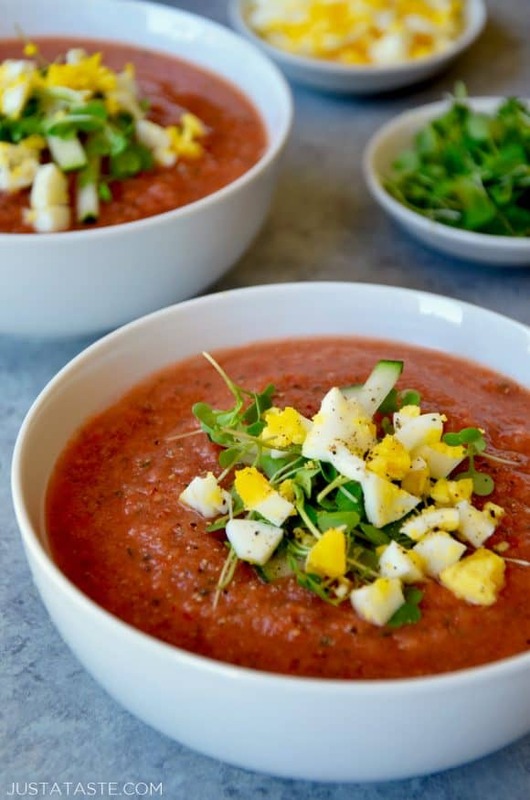 My love affair with gazpacho began long ago in Sevilla, Spain, where I lived with a host family during my junior year abroad. Gazpacho was on the weekly meal plan and it was always topped with a hearty portion of chopped hardboiled eggs and crispy bacon. 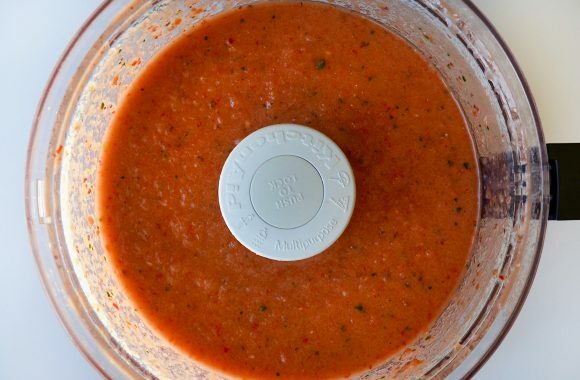 I’ve created this fast and fresh gazpacho recipe that incorporates an Anaheim (or Cubanelle) pepper, which lends a sweet flavor without any heat. I’ve also omitted the traditional addition of stale bread and kept this a super clean and low-carb dish. 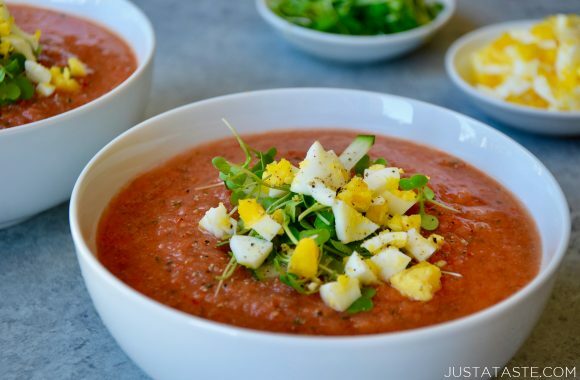 The gazpacho tastes best if it’s given a few hours (or even overnight) to chill out in the fridge so all of the flavors join forces and really intensify over time. I’ve garnished my bowl with a handful of micro-greens and sliced cucumbers for a bit of textural contrast, and a few slices of creamy avocado would also be a welcome addition to this cooler-than-ever concoction. Looking for more ways to beat the heat? Don’t miss Ahi Tuna Stacks with Ginger-Soy Dressing, Chinese Chicken Salad with Sesame Dressing and Watermelon Salad with Balsamic Syrup. 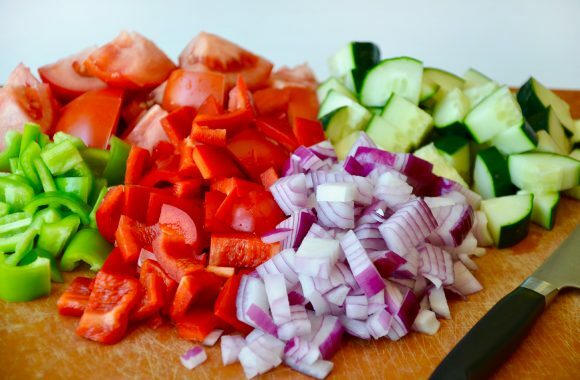 Add the chopped tomatoes, red pepper, Anaheim pepper, cucumber, red onion and garlic to a large food processor or blender. Blend until smooth, about 2 minutes, scraping down the sides as needed with a spatula. While the food processor is running, drizzle in the red wine vinegar and olive oil and continue blending until smooth. Taste and season the gazpacho with salt and pepper. 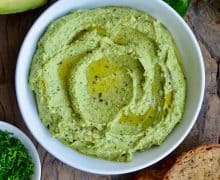 Serve immediately at room temp or transfer it to a container and refrigerate it, covered, until ready to serve topped with chopped hard-boiled egg, avocado or bacon (optional).